Downtime. It’s a word that crews would rather not contemplate, especially when deadlines are tight and the project is long or complex. One way to help avoid downtime is to be diligent about machine maintenance so you can avoid breakdowns and lost time. 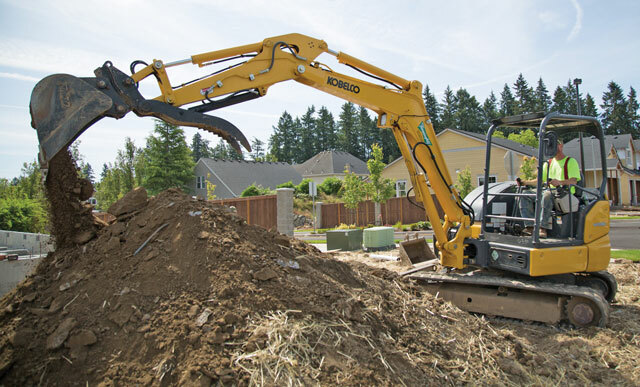 It’s especially important for your hard working mini excavator, but where should you start? The first step is to get familiar with your owner’s manual for daily, weekly and monthly maintenance checks and follow accordingly. 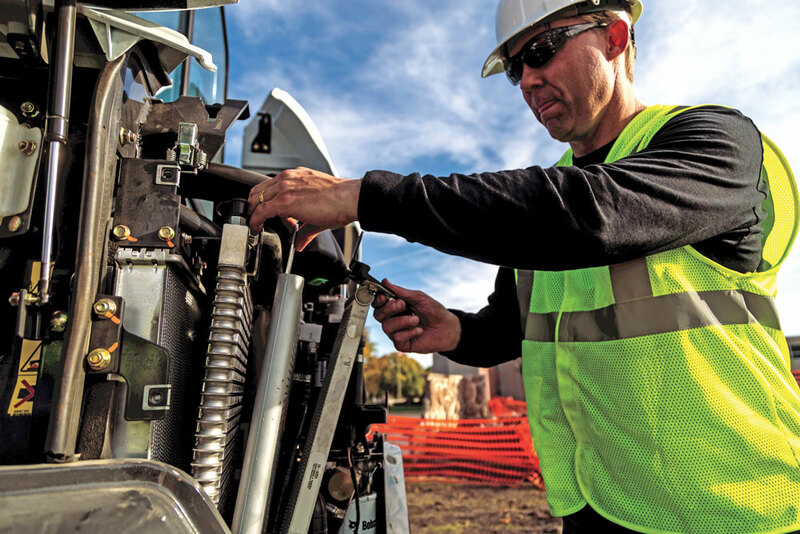 “An effective maintenance regimen starts with a daily check of fluids, including coolant, hydraulic fluid and engine oil,” says Jason Boerger, marketing manager for Bobcat Co. “If any of these levels are low, be sure to refill with the manufacturer’s recommended type of fluid, paying particular attention to classifications, as well as viscosities for the operating environment. It’s also important to keep these areas dirt free and use clean rags while checking levels to avoid contaminants. Tracks are considered one of the biggest wear items on an excavator, so it’s important to check them out daily as well. In addition to checking for obvious damage like cuts, maintaining the right track tension ensures your tracks stay in good shape for the long haul. An operator should make adjustments to the tension based on his or her jobsite conditions. Note: An excavator’s track tension should not be too tight or too loose. Weekly maintenance work includes all of the basic daily jobs, with a little extra attention on the machine’s undercarriage. This is a good time to give the undercarriage a cleaning because excessive dirt and debris can build up and lead to premature wear on components. Filter checks and changes may also need to be performed during this time period. Boerger points out that there are multiple filters on a compact excavator for the fuel, engine, air and hydraulic systems, and each may have different service intervals. Moving on to a monthly maintenance checklist, Dohnal suggests revisiting filters per the manufacturer’s service schedule, as well as washing the machine and performing a thorough visual inspection. All service points on JCB mini excavators are accessible from ground level. Maintenance may not be a favorite task on your to-do list, but it’s a necessity. To help lessen the pain of upkeep, manufacturers such as Bobcat and JCB are working to make their machines easier to service. Baby, It’s Cold Outside. Take Care of your Mini Ex! Hydraulic systems: Like all construction machinery, cold hydraulic oil flows less easily and smoothly in the extreme cold. This can lead to slight hesitations in control response, and in extreme conditions high engine rpm and cold hydraulic oil can lead to damage of the main pump and related components. Hydraulic oil viscosity should be adjusted during colder months, per the manufacturer’s recommendations for durability and reliability. Most, but not all, hydraulic tanks are pressurized via temperature and or movement of the attachment. Usually it is good practice (at a low engine speed) to boom up, arm in and bucket in. Hold this for a few seconds, and then lower the attachment. This ensures quick pressurization of the hydraulic tank by lowering the hydraulic oil tank level during full cylinder extension and then raising the pressure when the cylinders are extended. This pressurizes the hydraulic tank and creates a positive pressure to push oil toward the pump as you begin to work. This is NOT a substitute for proper warm up of the engine and hydraulics. 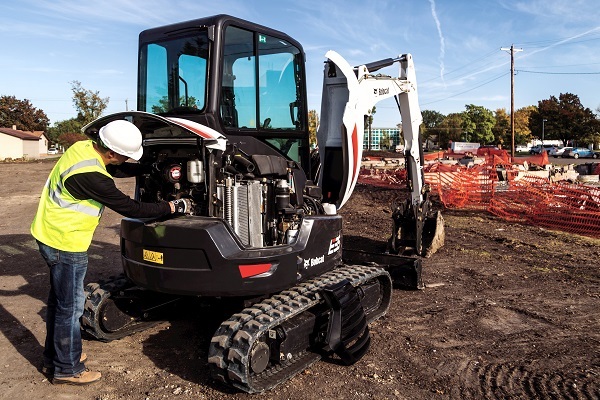 Engines: While it is true that mini excavators have much smaller engines than their larger cousins, the basic requirements for correct oil, antifreeze and in particular clean fuel is basically the same. 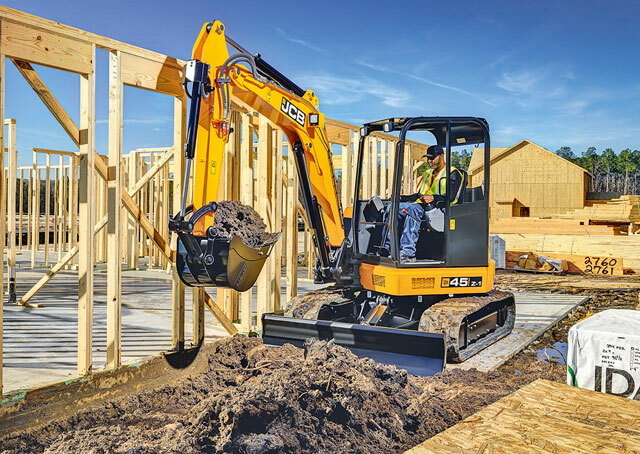 Many mini excavators are operated in rental fleets and by owner-operators. The need for clean fuel cannot be overstated. Due to increasing emissions regulations, injector pressures over 20,000 are not uncommon, and with today’s technology fuel is forced through microscopic holes in the injectors to fully atomize and combust the fuel/air mixture efficiently and cleanly. Tracks: Do not park a machine on wet ground or water overnight as it can freeze to the ground. Do not let mud build up on undercarriage components and then let it freeze, especially on rubber tracked machines. Click this clickable link for even more excavators.